This curved v-neck top features dropped shoulder and utility band, princess seaming, two front welt pockets, inner utility tape and yellow mesh pocket inside front pockets, back yoke, inner fit feature at back, double-needle tonal stitching, and side vents at hem. Center back length: 30". This v-neck top features contrast raglan sleeves with shoulder darts, front seams with two invisible top-loading pockets, double chest pocket with pen slow, tagless neck, and logo tag at side. Center back length: 30½". This v-neck top features raglan sleeves with shoulder darts, front seams with two invisible top-loading pockets, double chest pocket with pen slow, tagless neck, and logo tag at side. Center back length: 30½". This v-neck top features one chest pocket with pen pocket, cellphone pocket with media port and snap closure, curved shirttail hem with longer back length, sleeve pen pocket, and WonderFLEX LE badge at left bottom hem. Center back length: 31½". This straight leg pant features a full inner drawstring with flat front and ¾ elastic waist, natural rise, button front with functional zipper fly, seven pockets total (two front slash pockets, two cargo pockets with double pocket and WonderWink snap closure, two back pockets), WonderFLEX LE badge at back right pocket with velcro closure, five belt loops with one extended utility loop. Regular inseam: 31". Short inseam: 28½". Tall inseam: 34". This y-neck mock wrap top features two lower roomy hip pockets (including one WonderWink signature triple pocket), front angular and modern neckline, front and back princess seams, triple-needle stitching at the dropped shoulder, WonderFLEX LE badge at the wearer's right waist, and side vents. Center back length: 27½". This warm-up jacket features two lower roomy hip pockets (including one WonderWink signature triple pocket), curved front neckline, front yoke with two front princess seams, triple-needle stitching at the dropped shoulder, WonderFLEX LE badge at the wearer's right waist, and rib-knit cuffs. Center back length: 28¾". This cargo pant features six total pockets (four front pockets with two having secure closures with hook-and-loop fasteners, one cargo pocket, one back pocket), triple-needle stitching at pocket openings, mock darts, bungee loop, double-needle stitching at knee, knee seams, full elastic waist with full webbed drawstring, bottom vents, and WonderFLEX LE badge at cargo pocket. Regular inseam: 31". Petite inseam: 28½". Tall inseam: 33". This cargo pant features four total pockets (two front pockets, one cargo pocket, and one back pocket), triple-needle stitching at pocket openings, mock darts, bungee loop, double-needle stitching at side seams, back elastic waist with full webbed drawstring, bottom vents, and WonderFLEX LE badge at wearer's right side. Regular inseam: 31". Petite inseam: 28½". Tall inseam: 33". This curved notch-neck top features two lower tilted pockets (including one WonderWink signature triple pocket), banded front yoke with WonderFLEX LE badge above left pocket corner, triple-needle stitching at the dropped shoulder, and side vents. Center back length: 27¾". This fashionable pant features a flat front with full elastic waistband, functional fly front close, two front slant pockets, two back welt pockets, WonderFLEX LE badge, slim leg fit, and side vents. Regular inseam: 31". Petite inseam: 28½". Tall inseam: 33". 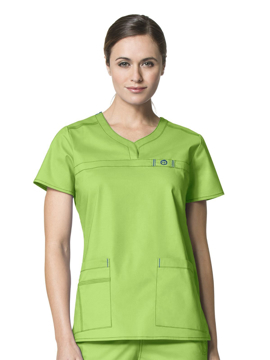 This color block top features two lower tossed pockets (including one WonderWink signature triple pocket), WonderFLEX LE badge above left pocket, and side vents. Center back length: 26¾". 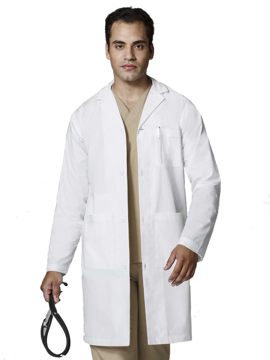 This lab coat features a chest pocket, two lower pockets (including one WonderWink signature triple pocket), hidden shoulder loop, wrap-around adjustable belt, and WonderFLEX badge at wearer's left waist belt. Center back length: 35¾". 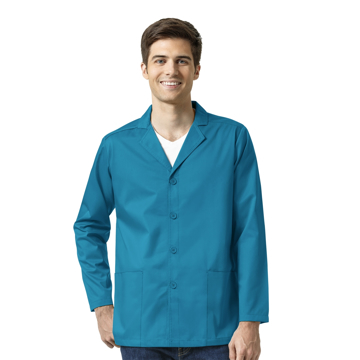 This consultation coat features a chest pocket, pen slot, large front pockets, white logo embroidery at pocket, inner tablet pocket, locker loop, back pleats, and bottom vent. Center back length: 31½". 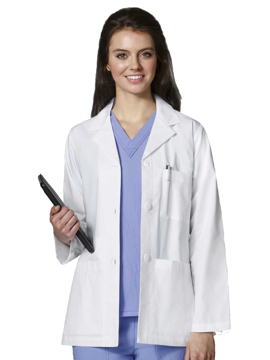 This consultation coat features a chest pocket, pen slot, large front pockets, side access, side vents, white logo embroidery at pocket, inner tablet pocket, locker loop, back pleats, and bottom vent. Center back length: 42". 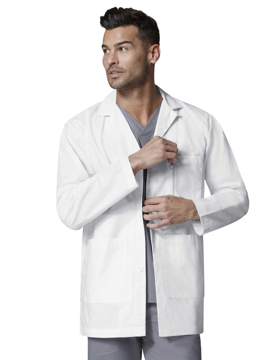 This consultation coat features a chest pocket, pen slot, large front pockets, white logo embroidery at pocket, inner tablet pocket, locker loop, back pleats, and bottom vent. Center back length: 29½". 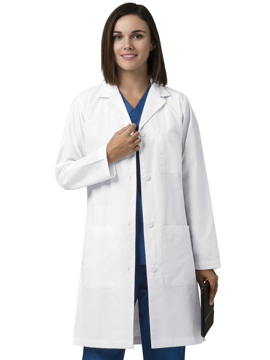 This consultation coat features a chest pocket, pen slot, large front pockets, side access, side vents, white logo embroidery at pocket, inner tablet pocket, locker loop, back pleats, and bottom vent. Center back length: 38".